The CliniMACS cell processing system, from Miltenyi Biotec, was modified by Fred Hutchinson Cancer Research Center researchers who were conducting a proof-of-concept study about the feasibility of point-of-care gene therapy. The study demonstrated that stem cells harvested from blood could be genetically modified by the system, which yielded cell products that met current manufacturing quality standards. The modified stem cells successfully repopulated the blood system when tested in animal models. Gene therapies and cell therapies—so full of promise, yet so difficult to implement—may soon be within the reach of clinics around the world, even those within resource-constrained countries. That’s the assertion made by scientists based at the Fred Hutchinson Cancer Research Center. They modified a table-top-sized commercial cell-processing device to do what would ordinarily require the specialized facilities and highly trained staff of a top-tier research center. The scientists reconfigured and reprogrammed the CliniMACS Prodigy®, a closed system that can process cells in accordance with current Good Manufacturing Practices (cGMP), so that it prepared gene-modified stem cells for transplantation. The modified stem cells successfully repopulated the blood system when tested in two different animal models. 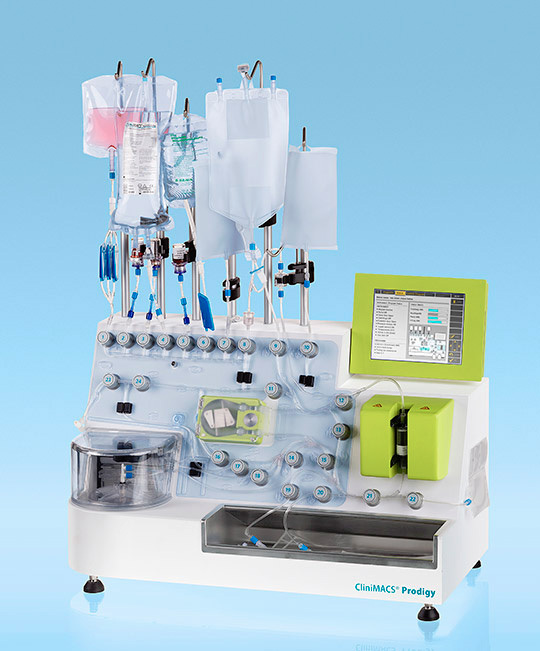 The CliniMACS Prodigy system, which is made by Miltenyi Biotec, uses specialized metal beads and magnets to separate stem cells from other blood cells. As modified by the Fred Hutch scientists, the system reduced the space required to produce the modified cells from 500 square feet to less than 5 square feet and the staffing from 5 or 10 people to 1 or 2. Details of this feat of miniaturization appeared October 20 in the journal Nature Communications, in an article entitled, “Semi-Automated Closed System Manufacturing of Lentivirus Gene-Modified Haematopoietic Stem Cells for Gene Therapy.” The article summarized the results of a proof-of-concept study that considered the prospects for improving the availability and standardized manufacture of hematopoietic stem cell (HSC) gene therapy. The authors also noted that in their study nonhuman primate autologous gene-modified CD34+ cell products proved capable of stable, polyclonal multilineage reconstitution, even in evaluations that took place after more than a year. The “gene therapy in a box” system would cost about $150,000 to purchase—a one-time investment that would be used for thousands of patients. An individual kit specific to the disease being treated would cost about $26,000. Though not inexpensive, the box could drive down costs of gene therapy because it requires less infrastructure and staffing. Even putting aside the clean-room and other infrastructure costs, it could be less than what cell-based gene therapy treatment costs research institutions now—between $38,000 and $55,000. This approach to portable gene therapy began with ideas generated by Jennifer Adair, a Fred Hutch researcher and the lead author of the Nature Communications article. Adair, according to a Fred Hutch-issued press release, was dissatisfied with the extraordinary efforts required to accomplish gene therapy in research settings, such as those she encountered in her work on cancer and HIV. Eventually, Adair shared her thoughts with Miltenyi's Tim Waters, who later became a co-author on the Nature Communications paper, which describes how the CliniMACS Prodigy device was modified to accomplish gene-modified gene therapy, including the clean-room jobs of adding the viral vector and removing residual reagents, and then developing components specific to each disease that would be available in “kits” and kept in pharmacy freezers. Included in each kit would be disposable tubing to carry the patient's blood cells from a sterile bag into the machine. A nurse would attach the bag to the machine and then add chemical reagents from the kit to pull out the stem cells, nutrients to support the growth of those cells, and the viral vector engineered to do the gene transfer for that disease. Additional disposable tubing would carry the modified cells to a second sterile bag that would go right into the patient's IV.